Oops! I Made A Mistake In My Chapter 13 Bankruptcy...Now What? Oops! I Made A Mistake In My Chapter 13 Bankruptcy…Now What? There are several rules that a debtor must abide by when filing Chapter 13 bankruptcy . For example, a Chapter 13 bankruptcy debtor is prohibited from transferring property without the consent of the bankruptcy court or borrowing money without first getting permission of the bankruptcy court. But what happens when a debtor inadvertently circumvents the established rules of their Chapter 13 bankruptcy case? Once a Chapter 13 bankruptcy debtor realizes they have made a mistake in the case, they need to contact their bankruptcy attorney immediately. For example, if a debtor forgets to mention that they won a lawsuit settlement or have increased income, the debtor should immediately let their bankruptcy attorney know. The bankruptcy attorney will then immediately inform the bankruptcy court. If you move quickly in your attempts to rectify your bankruptcy mistakes, the bankruptcy court may approve the action as if you had gone through the process correctly. For example, if a debtor took on a debt for a good reason but forgot to ask the bankruptcy court’s permission first. The bankruptcy court may be willing to approve the new debt after the fact, as if the debtor had gone through the proper channels in the first place. There are instances where a debtor may decide that the best corrective action is to dismiss their bankruptcy case. For example, if a debtor received an inheritance that was enough to cover their debts and leave a sizable chunk of money for the debtor afterwards, dismissing the Chapter 13 bankruptcy case may be in the debtor’s best interests. But before a debtor dismisses their bankruptcy case they should discuss with their bankruptcy attorney and carefully consider the ramifications of closing their bankruptcy case. If you have any questions regarding bankruptcy we are always here to help you. To set up a free consultation, feel free to give us a call or fill out our contact form . 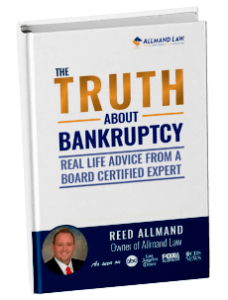 By Allmand Law Firm, PLLC|2018-11-07T22:32:41+00:00May 6th, 2010|Bankruptcy, Bankruptcy Dismissal, Bankruptcy Q&A, Chapter 13 Bankruptcy, Managing Your Finances|Comments Off on Oops! I Made A Mistake In My Chapter 13 Bankruptcy…Now What?